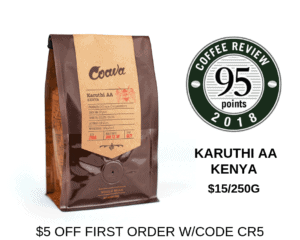 Produced from trees of the celebrated Ethiopia-derived botanical variety Geisha (also spelled Gesha). “Black” refers to a proprietary method of drying and fruit removal developed by innovative boutique exporter/importer Ninety Plus Coffee. Kakalove Café is a nano-roaster located in the small city of Chia-Yi in Taiwan that strives to procure and roast the finest quality coffee. Visit www.kakalovecafe.com.tw or email kahiyuho@gmail.com for more information. The Bottom Line: An intentionally ferment-toned Geisha cup with exquisite balance: notes of passionfruit on the sweet end of the spectrum and hops on the savory, with dark chocolate running through the whole.